WOMEN IN BLACK GROUP COORDINATOR TALKS REFUGEES, WARS, KOSOVO’S INDEPENDENCE AND HUMAN RIGHTS. Kristallnacht and barbed wire – permanent mark of Europe? On the occasion of the November 9th - the International Day Against Fascism and Anti-Semitism, Women in Black, the Youth Initiative for Human Rights, the Anti-Fascist Union of Serbia and the Autonomous Women's Center, organized the anti-fascist / anti-racist action called Kristallnacht and Barbed Wire - permanent mark of Europe. The protest was held on November 9th, 2018 in Knez Mihailova Street, Belgrade. "There is no place for refugees"
First we headed towards Horgos 2 (border crossing between Serbia and Hungary). There we did not saw anyone on the way to the border, and at the border crossing. Since Hungary has closed its border (three years ago), there are no refugees anymore. When we went to Palic to visit the reception center for refugees that was in the former Hotel Sport, which is today a devastated building, we found the only tenant of the object. Solidarity with Refugees / Migrants! On the occasion of the June 20th - World Refugee Day, we want to point out on the difficult situation for refugees / migrants around the world. We are witnesses of the open war of the European governments against refugees / migrants. Militarization of borders, fences and barbed wire, terror of the police against refugees / migrants, illegal deportations, abandoning the people in danger who are trying to reach European coasts, which turned the Mediterranean into a mass grave with thousands of victims, all these are the consequences of the catastrophic policies of European countries. We remember women raped in war! 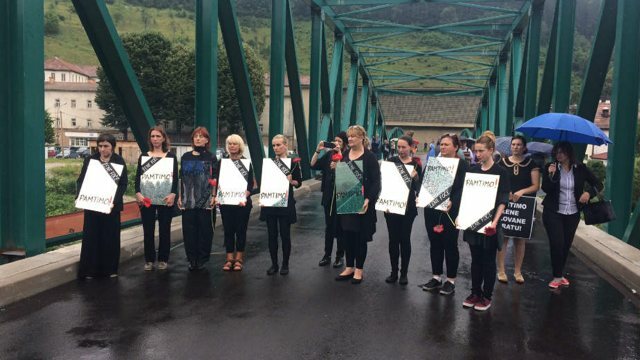 We remember women raped in the war in Bosnia and Herzegovina! "Ništa nam ne treba samo da imamo slobodu"
Promocija knjige "Kultura, drugi, žene"
At the moment, there is no translation for this page. "PAMTIMO POČETAK RATA U BIH"
JEDNA RASA - LJUDSKA RASA! PREKINITE SA NEGIRANJEM GENOCIDA U SREBRENICI! KRISTALNA NOĆ I BODLJIKAVA ŽICA – TRAJNI BELEG EVROPE? NEĆEMO DA RAĐAMO ZA DRŽAVU, NACIJU, CRKVU, ARMIJU NI PARTIJU! STOP OTPUŠTANJU RADNICA I RADNIKA TURISTIČKO-SPORTSKE ORGANIZACIJE U PROKUPLJU! STOP TURSKOJ AGRESIJI NA EFRIN! � 2006-2012. Women in Black - Belgrade. All Rights Reserved.